Today we're excited to make some of the biggest updates to the apps experience on Facebook since we first launched Platform four years ago. We are launching a major redesign to the Canvas Page to give your app greater real-estate on the user’s browser, and including a live ticker of real-time game related updates to keep the users constantly engaged and updated with their friends’ activity on apps and games as they play. 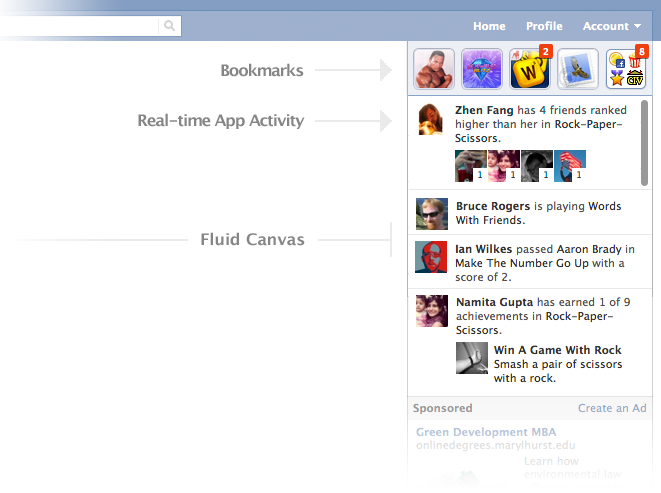 On the top right of every Canvas Page we show the bookmarks for your top apps and games for quick re-engagement. The red counters on the bookmarks notify users of outstanding Requests 2.0 related requests for your apps and encourage them to respond. 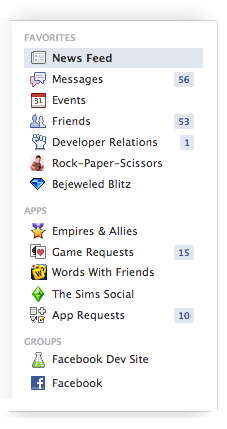 The live ticker below the bookmarks shows real-time app and game activity from a user’s friends to make the game playing experience on Facebook more social than ever. We automatically generate ‘playing’ and ‘using’ stories in the ticker when friends use an app or play a game respectively helping users re-engage and discover new games and apps that their friends are using. These are generated for apps that have enabled Social Discovery in their Developer App settings. In addition to the automatic stories, we are launching new Graph APIs for achievements and scores so you can publish stories for user’s achievements, passing friends’ scores, or leaderboard movement to make game play more competitive, social and exciting for your users. You now have the option to expand the size of your apps based on the user’s screen resolution. Fluid Canvas allows you to make your app left aligned so it takes up the full height and width of the user’s browser. You can enable Fluid Canvas, by selecting ‘fluid’ for ‘Canvas Width’ in your app settings. You can see early examples of game stories and fluid canvas in our Games Gallery. We’ve also updated the homepage bookmarks, so that the number and order of bookmarks in the groups and apps section is dynamic for each user. We’ve also added the ability to add bookmarks to a “Favorites” section which appears at the top of all bookmarks to make it even easier for users to get back to the apps and games that they love. Our goal with News Feed is to surface the most relevant stories to users from their friends, including high quality content from apps. We’ve begun rolling out a new ranking system that better surfaces app stories to the people who will most likely to engage with it, including those who don’t already use the app. Apps that post stream content which results in high user engagement will see more impressions for their stories. Conversely apps whose content is frequently hidden or marked as spam will see lower impressions. You should focus on publishing higher quality content and track user interaction in the Insights Dashboard to optimize for this system. To get started with new APIs and Fluid Canvas, refer to the documentation on our Developer Site. Please let us know if you have any questions or feedback in the comments below.